January 21, 2014, 11:15 AM · I spoke to Midori Goto in late 2013 in person at her studio at the University of Southern California in Los Angeles. This is Part 2 of our two-part interview. Here is a link for Part 1: Midori's recent recordings and global outreach programs. When Midori isn't jetting around the world to give solo performances at top orchestras and to lead outreach programs in other cities, she walks to work. And yes, she works at the University of Southern California, right in the heart of Los Angeles. "I do like the city," Midori said. "We sometimes have this image of six-lane freeways, and the traffic, and the smog, but it's really nice. The mountains -- there is actually so much nature. Sometimes the view is gorgeous, the sun is gorgeous." But she isn't here for the sun. "I like the job; that's the most important for me. I think my impression of the city is very much influenced by the job that I have and the community that I have here," Midori said. "I try to share duties and work with my colleagues, to all work together to bring the very best that we can to our students. We have a nice sense of community here." "Of course, I'm very much looking forward to the concert tomorrow…"
Midori has a way of deflecting attention from herself, especially when she is talking about her students and about USC's Thornton school. Indeed, during our conversation in early December at her studio, she spoke with me for some time about an upcoming USC concert. The night after our interview I attended it, a Beethoven Celebration, the culmination of many weeks' work by guest faculty Paul Katz as well as various USC string professors, who had coached USC student quartets as well as area high school student quartets. Midori told me that she had been monitoring the progress of the various student quartets. "I know the students quite well, not only my students," she said. "I know the way they play, through juries and different events. It's important to have that idea of where everyone's at and how they're doing." The larger-than-life superstar seems to have almost a stealth presence at these events, dressed in muted colors and sitting in the corner, greeting people cordially but firmly directing the spotlight to the USC event at hand. After the concert, Midori hung back in the hall while people exchanged congratulations. She quietly greeted students and colleagues, stopping to chat with her fellow colleague, Alice Schoenfeld. "Midori's presence at USC is huge in many ways," said Margaret Batjer, concertmaster of the Los Angeles Chamber Orchestra and Adjunct Assistant Professor at USC. "I have often described her as 'a force of nature' because I have never known a musician that is capable of retaining so much detail, assuming such large administrative responsibilities and yet still being able to walk on the stage and perform at such an extraordinary level. She is an extremely supportive colleague and never expects more of us than she expects of herself. She is an incredibly dedicated teacher and mentor to not only her students, but the entire department." Midori has taught at the University of Southern California's Thornton School of Music for eight years now. As the Jascha Heifetz Chair in Violin, she teaches in the same studio where Heifetz once taught during his tenure at USC, from 1959 to 1983. 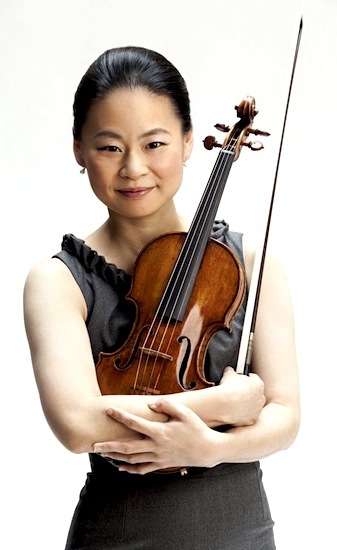 At present, Midori is the only full-time violin faculty at USC in a department of about 20 string faculty that also includes names such as New York Philharmonic concertmaster Glenn Dicterow (who will join USC full-time next season), Los Angeles Philharmonic concertmaster Martin Chalifour, longtime violin professor Alice Schoenfeld and many more. Midori teaches 10 students -- more than she is required to teach. She took on the duties of Chair of the Strings Department six years ago, and in 2012 was named Distinguished Professor of Music. This has not stopped her from continuing her busy and full life as a performing concert artist, as well as her extensive community engagement programs all over the globe. In fact, she said she enjoys the high degree of planning that her juggling act requires. "The general pattern is I leave on Wednesday, on a red-eye somewhere," she said. "Then I perform through the weekend, usually back Sunday or very early Monday morning, and I teach Monday-Tuesday-Wednesday, or Sunday-Monday-Tuesday. It's usually three to four days a week that I teach." She arrives at campus around 6 a.m. each morning that she is in town "and I try to get a block of practicing in the mornings. I practice in the mornings, I practice in the evenings." During times like the end of the semester, she doesn't schedule subscription concerts because "I never miss exams, I never miss juries, I never miss auditions." "I'm very happy being here," Midori said of her USC post. "Teaching is something that is so important; I can't imagine not doing it." Earlier in her career, Midori had taught on occasions such as master classes, but her teaching career took off in earnest in 2001, when she suddenly was called to the Manhattan School of Music to fill in for former American String Quartet first violinist Mitch Stern, a faculty member who had fallen ill.
"I was very fortunate that I didn't go in as an occasional master class kind of teacher, but I went in as a replacement for somebody who was taking medical leave," Midori said. "Being a substitute, you can't just do a fancy-sounding masterclasses. I started by being a regular teacher. What was even more: I had to follow the groundwork that had already been set by the teacher. If a student had been working on the Galamian scale and not the Flesch one, I wasn't going to change it right then to the Flesch scale. If they were working on this key, I couldn't suddenly change it. It was mid-semester, not the beginning of the semester. So everything was already in progress." "I came in in late February, and one week after I started -- spring break!" She laughed. "Right? Then you've got what, five weeks to go before your final juries? But it didn't give me any time to contemplate what to do or not to do -- just to do it. I had no choice but to be hands-on, to really get down to work and to set the partnerships with the students very quickly." During this time, Stern died from complications after surgery for a brain aneurysm. He was only 45. "So we were going through the period where they were really missing their teacher, somebody I had known and respected." Does Midori have any mentors in teaching? "My mother," she said without hesitation. "She was an incredible teacher." Of course, Midori's mother, Setsu Goto, was her first teacher, when she began playing as a toddler in Osaka, Japan. For one, her mother taught her that teaching must be individualized, she said. Also, she taught her about having patience. "She knows the details, she knows when to take the time. She sees the progression as a necessary process -- she accepts that it takes time," Midori said. "That's very important." In our frenetic modern age, people often look for an immediate assessment; "they want to see progress made in a very short span of time. Especially in a university or any kind of a school setting, you want to see this in terms of the semesters. And a semester is only three months, or 15 weeks. Officially, it's 15 hours of lessons. What can you do in 15 hours?" In fact, "if there is such a major change in certain things in 15 weeks, it might actually be something to be concerned (about)!" she said. "It's easier to make it look right than to make it feel right," Midori said. But a true teacher strives for the fundamental changes, for making it feel right and work correctly. "That takes time. It's a difference in philosophy, too." But wait a minute here, Midori was playing Paganini Caprices at age 6 and she made her New York Philharmonic solo debut at the age of 11. Doesn't that seem like rapid progress? "Yes, but it was a very patient approach," Midori said. "My mother is very interesting; she's so patient. She doesn't look for an immediate change. She has experience and training. Someone who is not as trained might not be able to see the progress, but she sees it as a course. Yes, this is the path that you have to go through. Sometimes you start to progress and then you stall. But that's sometimes part of the process -- that's what she expects. Because after that might come something even greater. But without that sort of halting, there may not be that surge later. So she accepts that; she doesn't get impatient about it." Midori said sometimes she'll teach a student a certain piece, "knowing that I want to learn it now with him or her so that we can bring it back in two years." That may seem strange to an outsider, but "I use it as an agent for something else. I use it as an agent to free the person up, or to encourage curiosity -- not really preparing to have an ultimate performance of that piece right away. And that's okay. It's a different approach. I think it's the way I was taught." She also likes to allow for individuality. "A couple of students could be working on the same repertoire, starting around the same time, and with the same teacher -- and they could sound so different!" Midori said. "I think that it's good. There are certain things that I might say: don't do that, because it's accident-prone, or you're going to end up hurting yourself. There are certain things that, there's no question, they're just bad." For example, failing to warm up on a regular basis -- warm up is a very important part of practice, she said. "No athlete would start immediately playing in the field, without warming up. Or without sufficient training. Of course, especially when one is young, sometimes one feels that one can get away with it, once. But that once then becomes a habit. It quickly becomes twice and three times, and then it becomes every day. Soon you realize that you can't really do whatever you used to do, and you don't know how to get back." "So it doesn't matter how well-developed your technique is -- or how well-developed the student thinks it is! There is no replacement for a good, solid warmup," she said. "A good practice can only be completed when your body is prepared to take on that practice." Still, students must be allowed to make mistakes and to experiment during the course of their study, she said. I observed that this can be true in teaching and also in parenting. "I think that's the way I was raised," Midori said. "Of course, one would want to prevent anything that you think is going to hold back your child. But my mother had always said that she was fearful of a child who was so protected, who was never exposed to any bacteria; then suddenly, you go outside, and there are all kinds of germs and you have absolutely no experience, and then you get bombarded! It's better if, little-by-little, you get inoculated. Then you learn to make the right choices when faced with these circumstances." Midori said that her non-musical academic experience also has affected her teaching philosophy, particularly her time at New York University, where she earned her bachelor's degree in Psychology and Gender Studies in 2000 and her Master's degree in Psychology in 2005. For those degrees, she was required to do things like writing theses, and presenting a two-hour oral colloquium. "Their philosophy was: We expect you to do this; we expect you to do well, because we're providing these possibilities and these opportunities for you to learn how to do it right," she said. "So it's not like you go and prepare on your own, but you take these courses and then you will be prepared. So that's something I take to heart: if you expect (students) to do certain things, then you have to give them the opportunity to learn how to do it." That's where being organized comes in handy. As Midori prepares for her own concerts and appearances, her students prepare for their performances as well. "I used to take my summers off, but now I'm actually performing all year," Midori said. "There's something about performing, that excitement that one feels. But again, it's also the process; I enjoy being organized in how I prepare things and how I schedule everything, including the lessons. Especially if I'm learning a new piece, or a doing new project -- I have a vision of how I'm going to prepare myself. It involves planning the repertoire two years, three years in advance -- not just deciding what to play, but how to prepare for it. You have to balance out the season in a way so that you have time to prepare." "I do a lot of run-through, practice performances, and that always happens here, in Los Angeles, because my assistant pianist is here, and she plays for all my students, too," Midori said. "We have a couple of partnership places where we can go and play. They understand that they are participating in the process of preparation for a performance, and they've really embraced this." In other words, several lucky nursing homes host Midori practice-recitals for their residents on a fairly regular basis. Do the students play for the practice performances, too? "Oh, we all go!" Midori said. "It's a wonderful opportunity, but it has to happen in the two or three days that I'm in town." Also, it has to happen in the right time cycle, to be useful in preparing for a later performance. For Midori, she may be preparing for a recording or learning pieces for concert performances next season. For her students, they may be preparing to play in competitions, auditions, juries, recitals or other performances. When I spoke with Midori, it was early December, and her studio was in the midst of a class project they do every year: "We go out 'Caroling,'" she said. "Yesterday we were at the hospital, and today we're going to a treatment center -- all these different settings. But yes, some of them are partners during the year, we go and do our run-throughs. I think it's a very meaningful time for the students. It's always a mixture of students who are brand-new to the studio, plus the ones who know that they have to do this every year." "For 'Caroling' we (play) things like 'Estrellita' and Kreisler pieces, Heifetz arrangements," Midori said. "These are a very important part of our repertoire, and sometimes it's difficult to find the right context to perform them in the university setting," she said. For example, requirements for student recitals don't really include these kinds of short pieces. "In the hospital yesterday, it was four of us, plus the pianist. The students went into the patient rooms and they did a movement of Bach, they also played at a nurses station, or in the lobby area," she said. "As a class, I make it an assignment: They have to learn something new for the short pieces. The Bach -- obviously, it's not new, but they have to prepare for it. So this is all takes a lot of organization." What other kinds of "class projects" has Midori devised? "For (my) Bach Project, for instance, I sometimes utilized the Bach Week we had as a class," Midori said. "I'd been preparing, specifically with this Bach Project in mind, for the last four or five years. One year I played only the Sonatas, and I played them, No. 1, No. 2 and No. 3. Some years I played just four of them. One year I played five in one sitting, no break." "I learned so much from being able to play Bach as a piece," she said. Students, who are often fearful of playing Bach, can also learn from playing it in more of a performance setting, "not as an audition, where you play one or two movements at most, and only parts of it." During Bach week, they have to play the complete Sonata or Partita, with repeats. "They can't just play the Chaconne, for instance, they have to play the entire D minor, if that's going to be their Bach," she said. They have to play that whole piece a minimum of three times that week -- more if they'd like. "Older ones, sometimes they like to do two, or three. But if they are doing two works, one Partita and one Sonata, for the three performances, they have to always play this couple. It's building stamina, too. That's how I build my stamina." "They hear me perform, and they hear me practicing," she laughs, "they hear me struggle!" Do you hear a struggle here? No. I hear only beauty. Here's Midori's 2007 recording of the Grave from Bach's Sonata No. 2 for solo violin.